District Supervisor David Campos and others in the LGBT and arts communities have organized a rally for tonight at 6 p.m. in front of the LGBT mural at the Galería de la Raza. 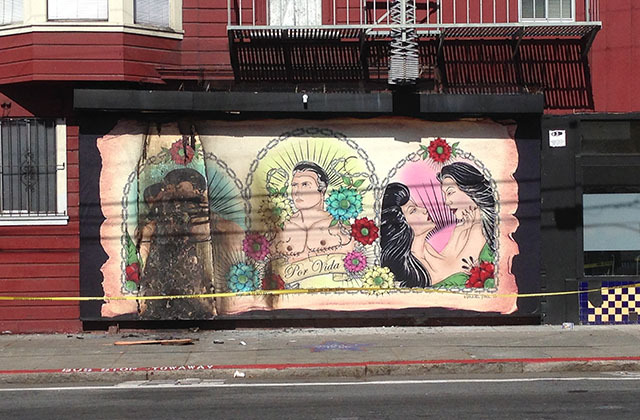 The mural, by Manuel Paul of the Maricón Collective, has been vandalized four times and replaced three times. It is in the outdoor wall space on Bryant Street that is reserved for digital murals. The latest incident of vandalism too place at 11 p.m. Monday night when the mural was torched. The mural had been replaced on Friday.